Training for climbing can be pretty taxing on the body and it’s pretty common to have plenty of aches and pains. Muscle tightness is something I encounter regularly after training and sitting at work all day doesn’t help things either. Stretching does help with some of this, but more recently I’ve started learning how to use a foam roller. I’ve found it really helps to target knots and tightness in both my upper and lower body. There are plenty of different rollers around and in some cases using a hockey or lacrosse ball will do the trick, but I’ve recently picked up some of the rollers from Black roll and really love how light and portable they are. 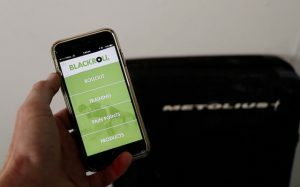 Black Roll have an app for iPhone and Android, so I suggest you simply download the app and give it a try yourself. It’s free and you can use any roller you can lay your hands on. Rolling increases blood flow and releases muscle tightness that can interfere with efficient climbing movement. So I recommend you target both upper and lower body, you’d be surprised how tight your hips, glutes, quads and calves can get! I find that some areas can be really quite painful to roll at times, so position your body to take weight off the roller when needed. Other times I feel pretty good so I support less weight or stack my legs to add pressure. Calves, by rolling from the ankle to below the knee. Glutes, generally using a ball and leaning into one side rolling forward and back. Hamstrings, rolling from the knees to the buttocks. turning legs in and out. Traps, rolling the upper back and posterior neck, then tilting slightly to the side to target rhomboids. Lats, lying to the side, but not completely and rolling from middle back to just under the shoulder. 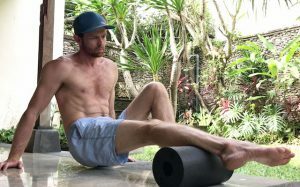 There are plenty more rolling exercises worth doing, including your chest and forearms, but I tend to prioritise according to time available and the way I feel. If you don’t already use a foam roller, give it a try and check out the Black roll app and products for more help.